Intranet – An intranet is a private network of an organization or company which can only be accessed by authorized users. The word “intra” means “internal” and so implies an intranet is designed for internal communications. Document and Content Management – It is the main feature of the Intranet system which store and manage company documents in the form of pdfs, files, spreadsheets, and many more. 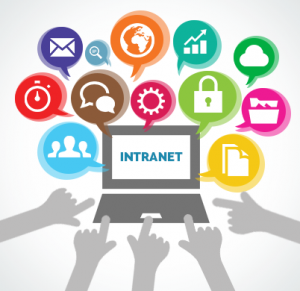 Intranet allows to employees of the company to store, access and share the content and documents securely with staff or manager of the company very easily. Integration – The company uses Intranet for integrate business important information and KRAs such as revenue and traffic generated, expenses incurred, total sales and production. It helps for employees to received updated information about their company. This will also help in take action for many business needs at a time and in generating reports by refreshing and combine important information of company when any important data changes. Workforce productivity: Intranets can help employers of the company is to place and view the information faster and use applications relevant to their roles and responsibilities. Employers can access data held in any database are available when company wants for any use with the help of Intranet. This software also helps for employers for increasing ability to perform their jobs faster, more accurately, and with confidence that they have the right information. It also helps in improving the services which is provided to the users. Time – It allows organizations for distributing information to employees on an as-needed basis and save time. Employees can link their important information for their convenience, rather than being distracted indiscriminately by email. Communication: Intranets is used for strategic communication and sharing important data within an organization to save the time. Employers have the opportunity for updating data with the strategic focus of the company by providing information on the Intranet. There are some examples of communication such as chat, email, and/or blogs. Low cost – Employers can view and maintain the information and data through web-browser rather than maintaining physical documents such as internal phone list, procedure manuals, and requisition forms. It helps in saving the business money on printing, and duplicating documents. Business operations and management: Local internet or intranets in the company which are helpful for employer in developing and deploying applications for supporting business operations and decisions across the internetworked enterprise. Previous Post How to increase low platelets count?